Linda Meredith is a name you have probably already heard when it comes to leading skincare professionals, and if you haven’t yet… you will. It is no coincidence that Linda has worked on the beautiful faces of Madonna, Gwyneth Paltrow, Kate Moss, Stella McCartney and Kate Beckinsale. She has been an expert in skincare for more than 40 years. Her philosophy is based around the knowledge that “staying young and beautiful for as long as possible is on every woman’s wish list”. Aside from her comprehensive list of incredible skincare for day, night, eyes et al, her mission was to develop her own skincare range with an effective alternative to Botox – her V-TOX cream uses algae derivatives to relax the skin. It also contains neuropeptides, and together with the algae, it surrounds the muscles with proteins to stop the skin contracting. In short, it’s a poison and toxin-free treatment, which lasts. The VTOX cream works, by helping the skin avoid conforming to expression lines when the muscles contract. To take this one step further, Linda created the ultimate V-TOX facial. This begins with the usual cleansing and steaming steps which precede lashings of VTOX cream, followed by pure oxygen blasts which help the product to infuse into the skin. The effects are quite astounding, and with continued use I imagine Botox lovers would convert in no time! Another brilliant facial to beat the ticking age clock is the HYALURONIC ACID TREATMENT. Hyaluronic Acid was once labeled ‘the key to the fountain of youth’. And no wonder – a naturally occurring polysaccharide found in skin tissue – which surrounds collagen to keep it nourished and hydrated. As with collagen, it slows in production as we age (deep sigh) which in turn like a domino effect, affects collagen and elastin (double deep sigh). So Linda created a brilliant hyaluronic mask which helps to restore that plumped, young looking skin, by building up moisture levels beneath the surface. The mask is made up of a network of pure collagen fibres that resembles our skin’s structure, which is kinda sci-fi cool, especially given that the masks are developed under strict scientific criteria, being considered “Active” once the correct levels of HA are added. At Linda’s salon it is possible to incorporate the HA mask into a CACI session (a device which stimulates the facial muscles to tone the skin) This combination is a sure fire way to look like you have had a facelift in your lunch break, without a knife or a needle in sight! See Stephanie at Linda’s salon, who makes sure to massage your head and neck with her strong hands I like to call wands. I have always been a huge fan of REN products. From the clean ingredients to the natural philosophy. So, I was excited to try the new REN rejuvenate facial at their flagship Away Spa, at The W Hotel, London. It is a revolutionary signature facial created by REN ‘Head Of Therapy’ Marielle Alix. With a title like that I expected good things and I was not disappointed. My therapist Jodine started by gently working with warm Jade stones, moving from the heart chakra to the occiput an effect which relaxes the mind and increases blood flow to every part of the skin. REN normally use their trademark anti-ageing Japanese Ko Bi Do facial techniques, which promote energy and blood flow to the surface of the skin for deeper muscle stimulation and enhance the penetration of their active products into the skin. Marielle has cleverly fused this Ko Bi Do with the stone massage therapy to help to detoxify the facial tissues. Next my skin was (happily) subjected to a cleansing detox, a Glycolactic Radiance Mask and a Flash Rinse 1 minute facial (a constant feature in my beauty cabinet). Next a wonderful feeling of smoothing and restructuring with the use of firming serum and firming oil. 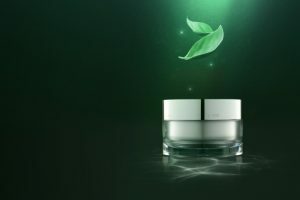 The combination of specifically chosen serums combined with the lifting and firming vibration and pressure point techniques boost hydration, lift and firm the contours of the face to achieve firm, smooth and radiant skin. Somewhere in there I felt the Good Vibration and afterwards I was told that it was due to the Pi stones energy flow, the Pi stones vibration and the lifting with pressure points. The facial was rounded off with a lymphatic drainage, ‘Instant brightening beauty shot eye lift’, ‘Instant Firming Beauty Shot’ and the cherry on the top – some ‘Youth Vitality Day Cream’. Given my post-facial younger appearance, you would be forgiven for assuming that I had gone under the knife. Quite rightly so. Yet this facial is a complete pamper and you will most likely, like me, drift off into never never land…the land of eternal youth. Book in with Jodine at The Away Spa who has mastered each technique beautifully, ensuring a makeover without the heavy-handed approach. A sheer delight. Neom products have always been a permanent fixture in my home, from the divine candles to the room sprays and body oils. In fact my wedding featured their Real Luxury candles on every table. So you can imagine my excitement when the flagship store in Wimbledon began to offer Wellbeing Spa Treatments. Walking into the Neom store is like entering a magical fairy wonderland, which smells of heavenly scents. On the treatment room doors you will see signs such as “Learn to be calm and you will always be happy”. 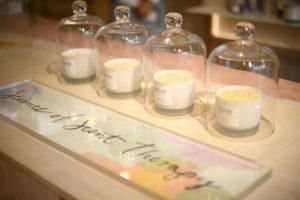 The treatment starts with a Science of Scent Therapy test. Four candles lined up, you breathe the scents and decide which one you are most attracted to. The science being that your body knows best what your mind needs most – kinda like speed dating but with candles! Depending on which scent you choose you will either have the Sleep, the De-Stress, the Energize or the Happiness treatment. Not surprisingly, I was attracted to candle number one, which turned out to be my wedding candle meaning I was destined for the De-stress Treatment. According to research – by 2020 the top 4 diseases will be stress related – so this was very welcome indeed. My wonderful therapist Emma explained that I would first encounter a guided meditation designed for my treatment. What a unique and revolutionary way to de-stress. The meditation guided me to breathe deeply and before I knew it I was floating into the distant ether experiencing the most effective of 6 therapies – meditation, shiatsu, cranio, Thai massage, trigger point and reflexology. Emma used melted candle oil to massage me, which was made up of lavender, jasmine and Brazilian rosewood, leaving me no choice but to calm my mind. De-stress sprays were used and the use of trigger points and reflexology sent me into scent heaven.